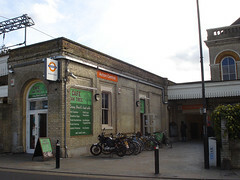 Zone 3 London Overground station on the North London Line. It has a level crossing, where the tracks go over Churchfield Road. According to Books For London, there's a free bookswap shelf at this station. Last edited 2015-03-01 17:28:36 (version 8; diff). List all versions. Page last edited 2015-03-01 17:28:36 (version 8).